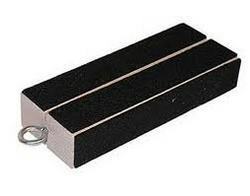 We are engaged in manufacturing and exporting a wide range of friction blocks. Specifically designed for high temperature severe duty application for coach and Transit. - Two phase matrix with high conformability to increases effectiveness. - Transfer film technology to give stable friction, reduce wear and noise. This quality is specifically designed for difficult, heavy duty application. This quality gives fade free stopping, longer Lining life and noise free operation. It has low swell and growth, which is ideally suited for automatic slack adjusters. Applications: Transit/Coach/School Busess, Refuse/Waste disposal vans. Fire/rescue/emergency trucks. Having a definite quality management system, we are engaged in manufacturing and supplying optimum quality Friction Block. - Widely used in order to be able to adjust the height of the tack. We are the leading manufacturers of Leather Friction Block in the market since long time and we supply Leather Friction Blocks to utmost all the suppliers at very affordable rates.